Tasmanian wine lovers rejoice! 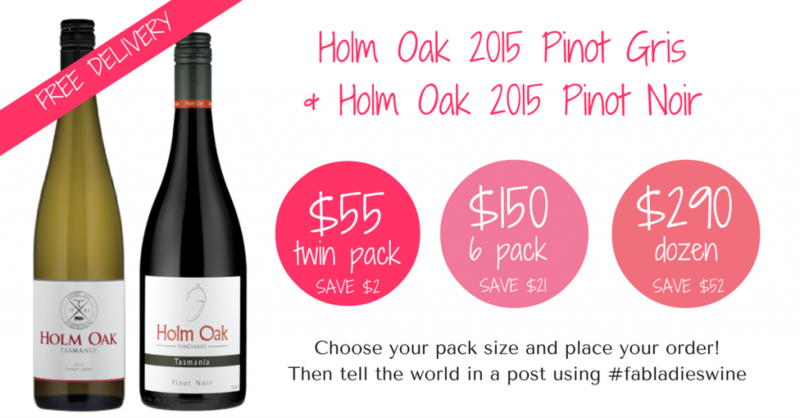 Because we are heading to the Tamar Valley this month for some seriously fabulous Pinot perfection from Holm Oak Vineyards. The ‘holm’ of true fabulous lady of wine, and one of our Australian Women in Wine Awards 2015 inaugural winners, Rebecca Duffy! What a legend this lady is and what a brilliant chance for all of us to try her wines this month! Holm Oak wines are produced from start to finish by Rebecca (winemaker) and her husband Tim (viticulturist) who do everything themselves – they grow, make and bottle their own wines on site which is not as common as you might expect. This month it’s a Pinot delight as we’re trying two of their Pinot wines! A Pinot Noir and a Pinot Gris. That should make their General Manager Pinot d’Pig very happy indeed. Click the ‘Buy Now’ button to be taken to the Holm Oak website where you can choose your pack size. And you’ll receive FREE delivery anywhere in Australia. Woot woot!! A good Pinot Noir such as this one is like a Brontë novel; intense, brooding, romantic and occasionally difficult to understand, but ultimately something so supremely enjoyable it becomes a cult classic. Look out Cathy and Heathcliff. The Holm Oak Pinot is hear to steal hearts. Pinot Gris is the sort of wine that can divide a nation quicker than a Trump tweet. But this Pinot Gris is ready to be so much more than just a First Lady – having conquered so many doubters she’s demonstrated that it is possible to be rich in texture yet at the same time searingly fresh and acidic. Enjoy buying the wines direct from Holm Oak! By purchasing your wine direct from the producer you’re supporting real people making gorgeous wines. Simply purchase your wines by clicking on the ‘Buy Now’ links above and you’ll be taken to the Holm Oak website to make your selection.